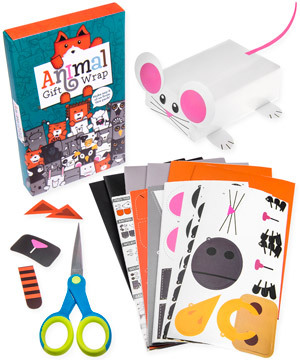 Animal Gift Wrap: Everything you need to bring your gifts to life! Everything you need to bring your gifts to life! 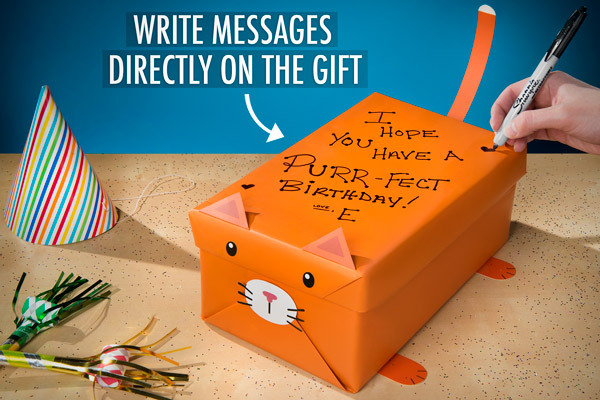 Creatively personalize presents with Animal Gift Wrap. This wrapping paper is a unique way to make giving presents even more special by decorating them to look like cute critters. 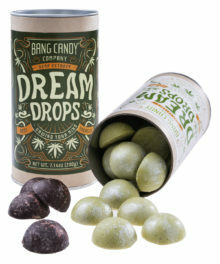 We sell plenty of awesome gifts, but you’ll need to wrap them before you present them to their recipient. And what better way to sheathe your surprise than the paper hide of an adorable animal? Each package of gift wrap includes enough material (wrapping paper, stickers, and cut-out sheets) to make six of the following twenty-four creatures: bat, cat, cow, elephant, fox, gorilla, gray whale, hippo, koala, lemur, lion, mouse, orca, owl, panda, penguin, polar bear, rabbit, raccoon, rhino, sheep, tiger, white whale, and wolf. In the wild, their appearances can help animals blend into their surroundings. 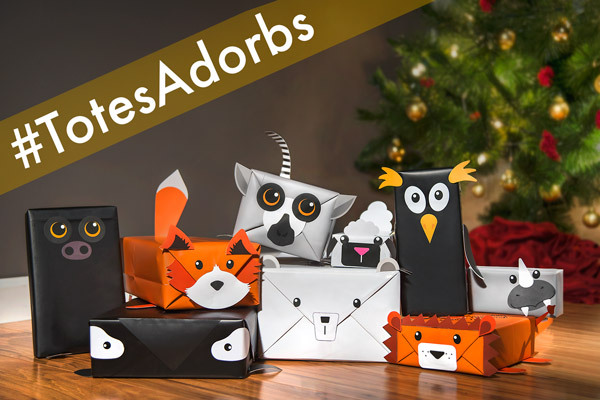 But with a gift decorated like an animal, these adorable creatures are sure to stand out. 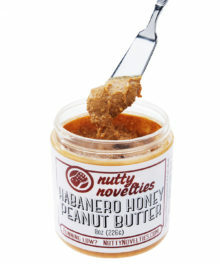 Their unique style adds a little extra specialness to the gift giving experience that you can custom-tailor to your gift recipient. Presents this cute herd together. 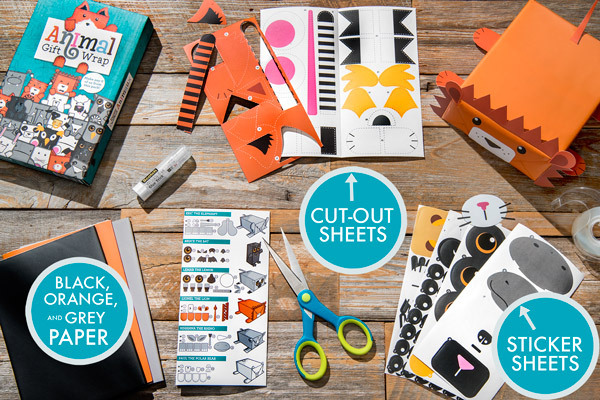 Except for scissors and tape (plus your present), each box of Animal Gift Wrap contains everything you need to create your own giftable animal. The kit contains black, orange, and gray paper with white reverses in a satin finish. Also included are 8 sticker sheets with adhesive anatomical details and 5 cut-out sheets for appendages. That’s enough material to make six different animals! With DIY construction, making these beasts is as fun as giving them away. 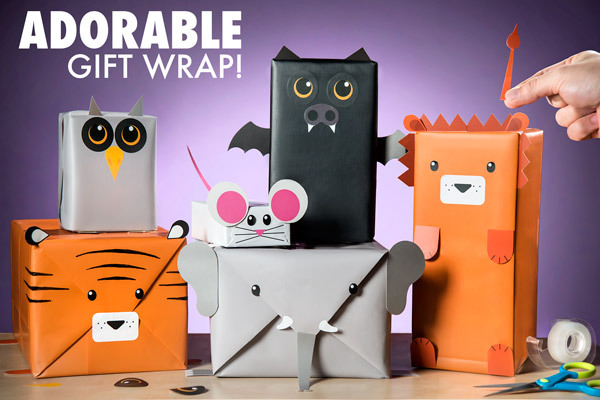 With Animal Gift Wrap, you have the tough responsibility of choosing from the following twenty-four cuddly creatures: bat, cat, cow, elephant, fox, gorilla, gray whale, hippo, koala, lemur, lion, mouse, orca, owl, panda, penguin, polar bear, rabbit, raccoon, rhino, sheep, tiger, white whale, and wolf. When you’ve made your selection, you can do it five more times! 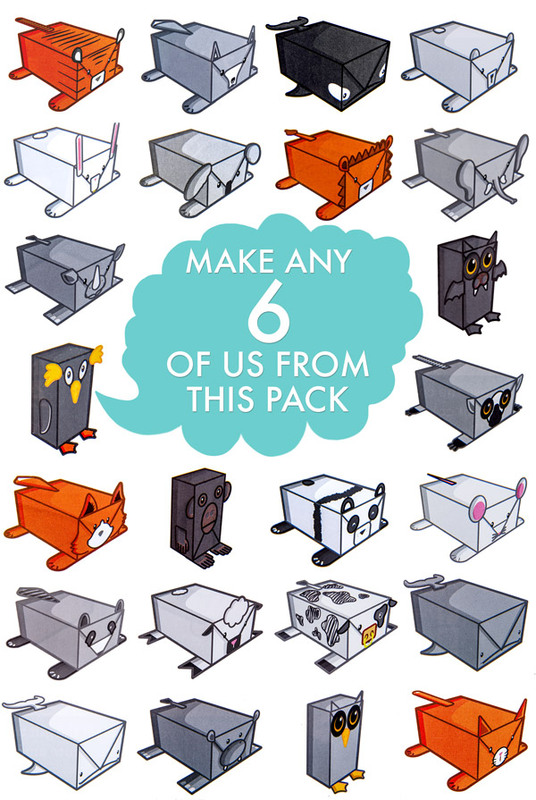 To be perfectly clear: There are enough materials included in the box to make any 6 of the 24 animals pictured below. Make a menagerie of adorable animal presents. Animal Gift Wrap is so unique that there won’t be any question of who the gifter is; nobody’s going to forget the woman who brought a gorilla to the party. But sometimes an extra-special present needs an extra-special message. The satin-finish paper gladly takes your brand without smudging or wiping away. 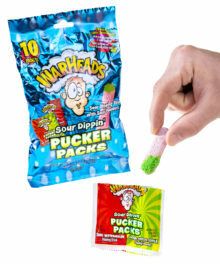 The packages are perfect for wishing someone the happiest bear-thday, mazel tov on a bat-mitzvah, or celebrating someone special no matter what the occasion. Happy Mouse-di Gras! This pretty kitty is a present and card all in one. These animal-shaped presents are just so stinkin’ cute! 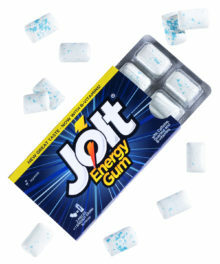 In fact, the giftee might even feel bad about tearing the paper to open it. They’ll take solace in knowing that if you bothered to wrap their present with such a cuddly critter, there’s bound to be something special inside. The best thing to do is think of it as a temporary pet you don’t have to clean up after.